One of our latest recipes and videos is all about the making of the famed Texas Style BBQ Sauce. This BBQ Sauce is bold with rich flavors that take you mentally back to pit smoked large scale beef ribs and brisket. Keeping those bold flavors in mind we thought we would give you a leg up by teaching one of the most popular styles of bbq sauce that are out there on the market today. Keep in mind this traditional recipe is one we learned from direct from the state of Texas. Just follow the video and have your basic ingredients ready to make this bold bbq sauce. This How To Make Homemade Texas Style BBQ Sauce video teaches you the ingredients and process needed to make Texas, BBQ Sauce. This is a no frills approach to making these bbq sauces. We show you in short order by adding each of the ingredient elements and further labeling the elements on the screen. Because this is a video now on YouTube you can pause or play forward the video anytime you want. Catch all the relevant elements for making the type of bbq sauce your want or just speed ahead to the next. 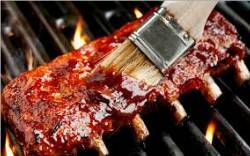 We hope you find this information on How to Make Homemade Texas Style BBQ Sauce Recipe useful. We believe the ingredient process for this video and the resulting sauces is relatively easy. Most of the ingredients can be found in the average kitchen cabinet. Once the sauce is made you can store it in a container in your refrigerator for at least a week or more. Just reheat after removing them from the fridge and your sauces are just like new.